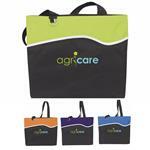 A new trade show or all purpose custom tote bag in 4 stylish color combination. Mesh water bottle pocket, shoulder-length handles, contrasting color stitch detail. 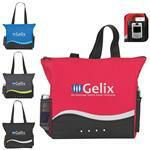 Made of durable 600D PolyCanvas. 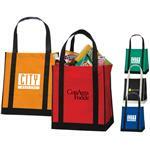 A rush tote bag - FREE 1-DAY RUSH PRODUCTION AVAILABLE! 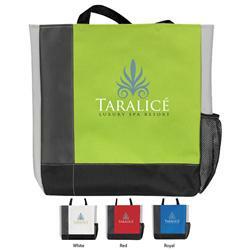 Available Colors: Apple Green, Blue, Red and White. Production Times Available: Free 1-Day Rush Production Available. Standard 7-Day Production with Paper Proof. Dimensions: 14 1/2" x 15 1/2" x 2 1/2"
Typical Imprint Area(s): Screen: 8" x 6"
4-Color Process: 6 1/2" x 6 1/2"
Embroidery: 4 1/2" x 4 1/2"
Available Imprint Options: Screen, Full color imprint or Embroidery. Packaging: Standard - 21 lbs. (approx.) @ 50 per carton.